Our current dependence on fossil fuels is on a collision course with the need of future generations for a habitable environment. Supplying more than 80 percent of human energy consumption globally, fossil fuel combustion contributes to the rise of atmospheric greenhouse gases such as CO2, nitrous oxide, and methane, which are widely believed to cause detrimental climate change. We can mitigate these effects by using the many available no- or low-carbon methods to harvest energy, including wind, geothermal, hydroelectric, and solar approaches, such as the harvesting of plant biomass that can be burned as solid or liquid fuels. Conversion of biomass is currently the most cost-effective route to produce renewable liquid fuels, and contributes 78 percent of the total renewable energy worldwide.[1. International Energy Agency, “Energy technology perspectives 2010: scenarios and strategies to 2050,” Paris: OECD/IEA, 2010.] At present, liquid biofuels are derived primarily from plants that are also used for food and feed, such as corn and sugarcane, raising concerns that the industry may not be sustainable in the face of expanding demand for food, feed, and fiber. However, efforts to grow biofuel crops on land unsuitable for food and feed crops, to increase biomass yield, and to facilitate the conversion of biomass to liquid fuels may change that mind-set. With continued improvements, we believe that biofuels can be produced on a large enough scale to meet roughly 30 percent of the demand for all liquid transportation fuels in the United States within 25 years—more than four times the current contribution of roughly 7 percent. 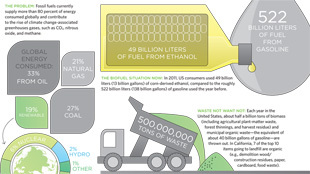 There are two main types of liquid biofuels: biodiesel and ethanol. Biodiesel is produced primarily from triacylglycerol, a lipid obtained from soy, canola, other oilseeds, and palm fruits. Rendered animal fats, such as tallow and lard, and used cooking oil can also be converted to biodiesel, but are available in relatively small amounts. Biodiesel fuels can be used directly in diesel engines or blended with conventional diesel from fossil sources. Ethanol is primarily made by using yeast to ferment sugar extracted from sugarcane and sugar beet, or from the starch of corn, wheat, and cassava. Because temperate oilseed crops have much lower biofuel yields per unit of land than starch or sugar crops, such as corn, sugarcane, and sugar beet, the current production of ethanol requires less land per unit of biofuel than does biodiesel. We believe that biofuels can meet roughly 30 percent of the demand for all liquid transportation fuels in the United States within 25 years. In the United States in 2011, fermentation of corn-derived sugars yielded about 49 billion liters of ethanol, which was mostly used as a fuel additive. This accounted for 38 percent of the country’s 32.2 million hectares of land used to grow corn for grain (additional corn is grown for silage). It is important to note that most of the increase in use of corn for ethanol has been accompanied by both an increase in yield of the US corn crop (tons of grain per acre) and additional acreage for corn. Thus, overall production of feed corn and corn exports have not been reduced, rather corn for ethanol has been added to production in the U.S. Following ethanol production, approximately 35 percent of the mass of corn kernels is recovered as a high-protein residue, called dried distiller grains, which has high nutritional value and is used as cattle feed. Harvesting corn also creates large amounts of stover—leftover leaves, cobs, and stalks—similar to the bagasse yielded during sugarcane production. Unlike sugarcane bagasse, however, which is combusted for heat and electricity to drive the distillation process, the highly cellulosic stover is typically unused and left in the field. Thus, one way to increase biofuel production is to take advantage of the leftover plant materials currently being discarded. 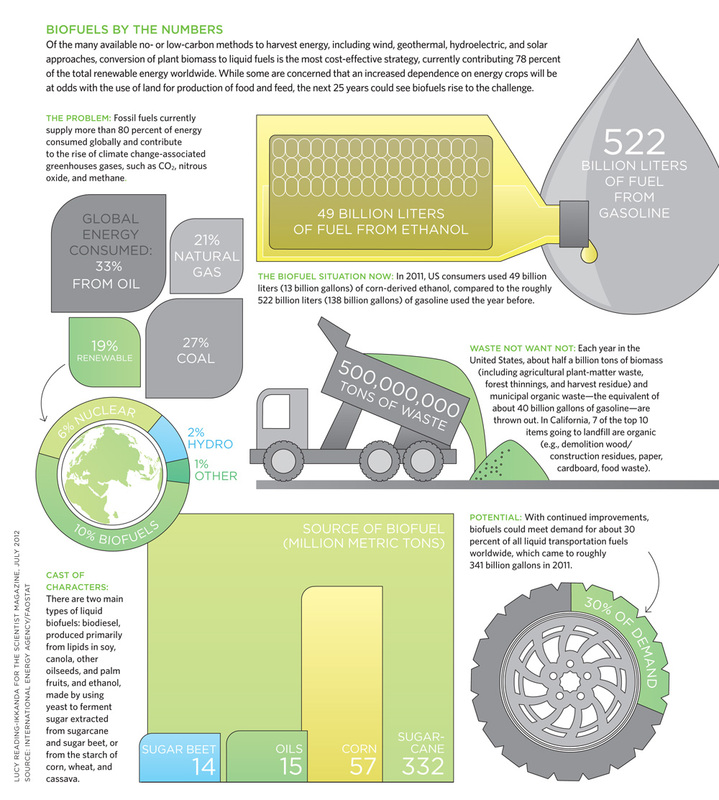 In terms of global grain and seed production, corn, or maize, is the most prevalent crop, producing about 820 million metric tons of grain and a similar amount of stover that is potentially available for fuel production.2Recent studies estimate that the net energy return for corn ethanol could be almost doubled by using stover for production of heat and electricity, and that conversion of half of US maize stover to cellulosic ethanol would produce about 13.5 billion additional gallons of ethanol. However, there is concern that removal of even half the stover from the fields would unsustainably exacerbate erosion and losses of soil carbon, and would also require additional inputs of fertilizers to replace lost minerals. Similarly, other crop residues such as wheat and rice straws could be used for fuel production. The relatively low amount of residues produced per hectare from crops other than maize, however, may impose unacceptably large costs for collection and transportation to refineries. Another potential source of biomass that could be better utilized is woody plants, which have for years been sustainably harvested for lumber and paper. By one estimate, the biomass that is harvested annually in the Northern Hemisphere for wood products has an energy content equivalent to approximately 107 percent of the liquid fuel consumed in the United States. Globally, large areas of land formerly used for agriculture have reverted to forest,[3. J.E. Campbell et al., “The global potential of bioenergy on abandoned agriculture lands,” Environ Sci Technol, 42:5791-94, 2008.] and the continuing trend to electronic media and paper recycling may reduce the demand for pulp woods. This presents an opportunity to reallocate woody biomass for energy. There are also substantial amounts of organic municipal solid waste, such as demolition wood, paper waste, and yard trimmings, that could be used for biofuel production. SLIDESHOW: Take a look at a new generation of plants that are being modified to increase biofuel production. Another tactic for increasing biofuel production is to engineer high-biomass plants that are resistant to a variety of environmental stressors, such as drought, flooding, salt, cold, and pests. Approximately 18 percent of the Earth’s terrestrial surface, including much of the 600 million hectares of land that has fallen out of agricultural production, is semiarid and prone to drought. Plants that can be grown on such land could dramatically increase biofuel crop production without competing for land used for food crops. For example, Agave species, a type of plant native to hot, dry regions, utilize a type of photosynthesis, called Crassulacean acid metabolism, that strongly reduces the amount of water transpired during growth by enabling plants to fix and store carbon dioxide as C4 organic acids during the cooler night, then complete the photosynthetic cycle during the day while keeping stomata closed, minimizing transpiration of water. Thus, Agave plants use water as much as six times more efficiently than C3 species, such as wheat. Indeed, some Agave plants have been reported to exhibit high harvested biomass yields on semiarid land when harvested on 5- to 6- year cycles. Furthermore, because several Agave species have been cultivated for production of coarse sisal fibers, used to make rope, or for alcoholic beverages, agronomic practices for these plants are well established. Selection for cold tolerance will likely be another important effort in extending the range of highly productive biomass species. In some cases, tolerance may be achieved by production of hybrids, such as Miscane, a cross between tropical sugarcane and cold-tolerant Miscanthus species. Miscane is resistant to damage from frost and freezing of rhizomes, and can become dormant during short days, allowing the plants to survive overwintering. Pests and pathogens also threaten the production of bioenergy crops. Recent studies of prospective energy crops, such as switchgrass (Panicum virgatum) and Miscanthus, have confirmed that these species harbor a wide variety of viruses, fungi, insects, and nematodes. Because these crops are replanted relatively infrequently—only every decade or so—it is not possible to minimize biotic stress by regularly alternating genotypes or species. Presumably, the best strategy will be diversification of the plantations to maximize the genetic diversity of relevant tolerance and resistance pathways. Mixing species together in a way that mimics natural grasslands could accomplish this and provide habitats for more diverse populations of organisms. Indeed, some research has suggested that natural grasslands have higher productivity than pure stands of grassland species, though other results suggest that the effect may apply only to very low-productivity settings. However, the use of diverse genotypes may trigger problems in managing interplant competition that can limit yield in older varieties of some crops, such as maize and wheat. In order to minimize the amount of land diverted from other purposes to energy production it is essential to maximize the yield—the amount of biomass produced per unit of land. Unlike crops used for food, where much of the yield gain during the past century was accomplished by minimizing the amount of biomass in the leaves, stalks, and roots in favor of grain, the opposite strategy is desirable for energy crops. One strategy is the prevention of flowering, which could allow plants to remain in a vegetative growth phase longer, thereby extending the period of biomass accumulation. Additionally, allocation of resources to seed development is relatively inefficient compared with production of additional leaf and stem biomass. 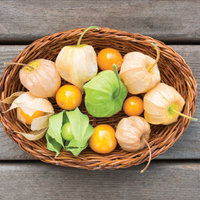 Thus, eliminating production of fruit or seeds is likely to increase total biomass and may also protect against unintentional spread of energy-crop species. 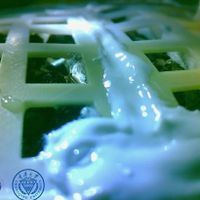 However, in order to propagate energy crops with maximal efficiency, it would be desirable to develop systems that allow production of seeds under controlled conditions, as propagation by other means, such as tissue culture, rhizomes, or cuttings, is often more expensive and may require specialized equipment. A possible strategy for implementing conditional flowering and seed production is to regulate the photoperiodic induction of flowering, which occurs in response to the amount of daylight in a 24-hour period. For example, plants native to more polar latitudes might be bred to grow in equatorial regions, where the photoperiod may not be long enough to induce flowering. Recent progress in understanding photoperiodic induction may allow new approaches to controlling seed development in energy crops. Similarly, successes in developing chemical control of gene expression in plants may allow the development of crops that flower only when treated with an inducing compound. Modification of plant architecture may also play an important role in maximizing biomass yield. The existing varieties of energy crops, like Miscanthus and switchgrass, have a tendency to drop their leaves during late-season senescence, thereby significantly reducing yield. Selection for leaf retention could have a major benefit. More generally, plant height, tiller number (the number of shoots), leaf density, and stem thickness are determinants of biomass productivity. Altering root architecture may also be a good approach, as it could increase water- and nutrient-capture efficiency, as well as soil carbon accumulation. 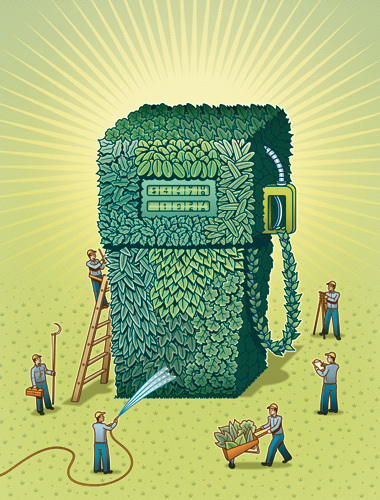 Another way to increase the production of biofuels is to grow feedstocks that are more easily converted to fuels. Most of the mass in the bodies of plants are cell walls, which are primarily made of lignin and the polysaccharides cellulose and hemicellulose. Biochemical conversion processes are designed to break down, or depolymerize, the polysaccharides into sugars that can be fermented to fuel. The lignin can be used to produce heat and electricity to support the overall biomass-to-fuel conversion process. At present, the various conversion processes that are advancing towards commercialization have high capital costs and high operating costs per unit of fuel produced, relative to the price of petroleum-based fuels. Consequently, there is a lot of interest in genetically altering the chemical composition or structure of biomass to render the conversion process more efficient and less expensive. Alternatively, if it were possible to separate lignin from polysaccharides before depolymerization of biomass, the problems caused by lignin might be significantly ameliorated. However, no pretreatment processes are available that can remove all the lignin from plant material, possibly because, in herbaceous species, lignin is covalently linked to hemicelluloses that are hydrogen-bonded to cellulose. Thus, a largely unexplored opportunity might be to reduce or eliminate the enzymes that cross-link lignin and hemicelluloses, or to introduce new components into lignin that are susceptible to enzymatic or chemical cleavage, making it easier to dissociate the plant’s components. Finally, it has been suggested that increasing the abundance of easily depolymerized polysaccharides could increase biofuel yield. In principle, it may be possible to significantly increase the amount of cellulose, hemicelluloses, and other polysaccharides in cell walls. It was recently observed, for example, that corngrass1, a mutation in maize, alters both cell-wall chemistry and starch accumulation. These effects increased the amount of sugar released by depolymerization. 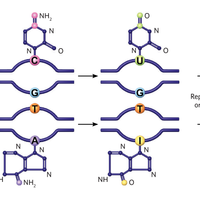 The same effect was observed when the mutation was engineered in switchgrass,[10. G.S. Chuck et al., “Overexpression of the maize Corngrass1 microRNA prevents flowering, improves digestibility, and increases starch content of switchgrass,” PNAS, 108:17550-55, 2011.] raising the tantalizing possibility of engineering energy crops to produce more fermentable sugars for biofuel production. The mechanisms that control synthesis and deposition of these polymers are only just beginning to be uncovered, however, and it will be important to carry out careful measurements of the effects of such alteration on total yield per acre under a variety of growth conditions to test whether such changes have practical utility. The world’s population is expected to grow by approximately 50 percent before stabilizing later this century. 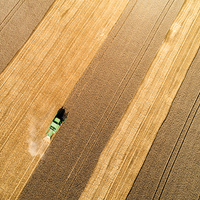 The pressures to expand food and energy production while simultaneously reducing our carbon emissions and preserving ecosystem services is expected to create many conflicts concerning land use and agricultural practices. We envision that progress in exploring the research and development themes outlined here concerning next-generation biofuel feedstocks will help to address some of the conflicts, and may confer additional benefits related to the economic and environmental sustainability of agriculture. Such advances will require the participation of researchers in wide-ranging fields, including ecology, environmental sciences, plant biology, microbiology, biochemistry, chemistry, genetics, and policy. However, we anticipate that by implementing a broad-based approach, it will be possible to make rapid progress towards a partial solution to the climate and energy dilemma while also minimizing failure due to enthusiastic myopia. Heather Youngs and Chris Somerville are researchers at the Energy Biosciences Institute of the University of California, Berkeley. Clarification (July 4, 2011): This story has been updated from its original version stating that 2 gigawatts of electricity were produced from bagasse in Brazil in 2009. The amount stated is an average rate of electricity production throughout the year. The Scientist regrets any confusion.